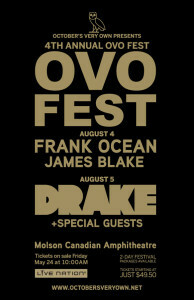 In what has become a hugely anticipated annual event, OVOFEST 2013 has been officially announced. 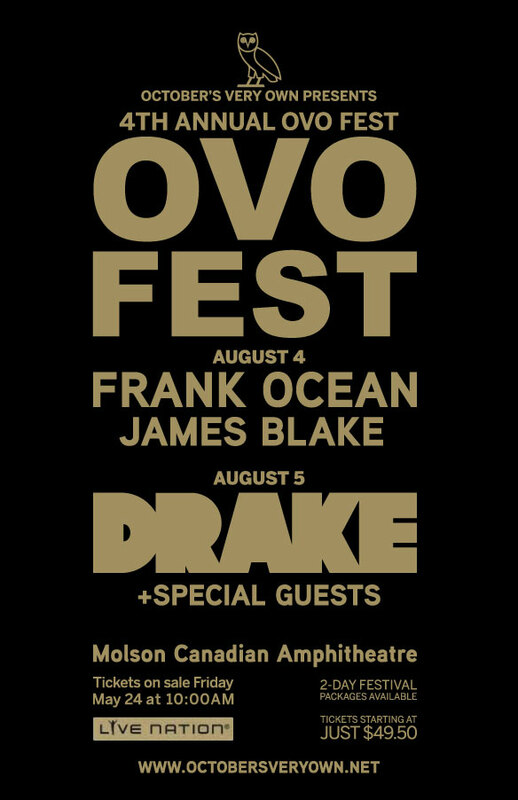 Today news of this year’s festival broke on the October’s Very Own blog, which revealed that Drake himself will headline the show, performing on August 5 while Frank Ocean and James Blake will perform August 4, plus more ‘special guests’ still to be announced. The fourth annual event will be held at Toronto’s Molson Amphitheatre. Drizzy is guaranteed to deliver yet another spectacular show. With previous guests including Jay-Z, Snoop Dogg, Eminem and Nicki Minaj – the man sets a high standard. Meanwhile Kanye West and 50 Cent are both scheduled to be promoting new albums in 2013, there is a good chance they too will feature. OVOFEST is a tribute to Canada and throughout the show Drake shows his love. Last year Drake showed off his fresh ‘416’ tattoo which represents the area code of his hometown. Driz has always been conscious of his presence in Canada and those Canadians seem to love him right back. This just keeps us wondering when’s Drizzy’s bringing that ‘north north’ flair down under.